It must be terribly difficult to leave everything behind when serving our country but especially difficult when you must leave your beloved pet. 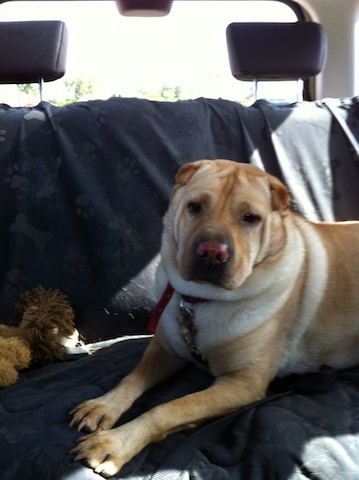 Bruce's Dad was deployed overseas and with no family to keep his Shar-Pei Bruce until he returned, he surrendered him to rescue knowing he would at least be cared for and a loving home found. Raising Bruce from a puppy, he felt like he was giving away his child. It is our hope that someone will support his Dad just as he has supported us, and give Bruce a temporary home until he returns next year. Bruce is neutered, current on vaccinations and heartworm negative. He is grieving for his Dad and we are hoping a home comes along very soon. Please share with others that you think might consider helping Bruce and his Dad. I know the huge hearts and giving spirit of the Shar-Pei community and I'm reaching out to you to help keep this family together. Let's find a temporary home for Bruce so we can send his Dad the great news that his boy will be waiting for him when he returns.